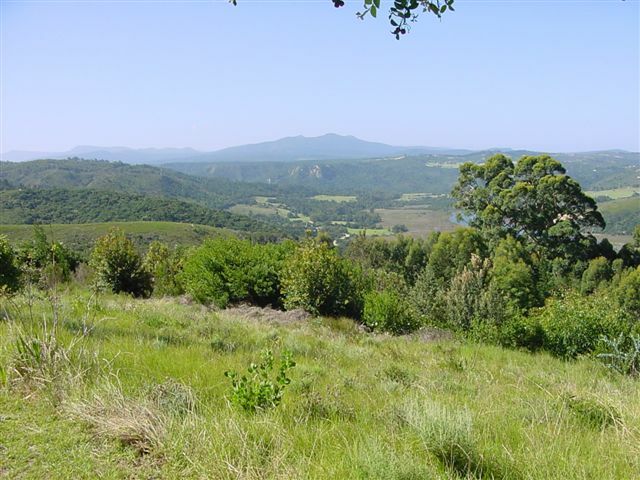 Rheenendal is the closest rural area to Knysna - situated midway between the Outeniqua Mountains and the indigenous national forests to the north, and the lagoon and sea to the south. Rheenendal, Knysna, is a picturesque, quiet and tranquil area, only 15 minute from Knysna. In the other direction are the forests with walking and cycling trails, and picnic spots on the banks of the river. This farming community appeals to people who seek the peace and seclusion of living close to nature. Its beauty and geographical location have historically attracted nature lovers who flock to the area for a holiday in Knysna. There are thus quite a number of self-catering establishments and guest houses in Rheenendal. A typical smallholding in Rheenendal would measure about 3 hectares, but bigger farms of around 100 hectares are also available. The land is zoned Agriculture 1 and all forms of farming activity is allowed. Besides the holiday accommodation in Rheenendal, one finds equestrian farms and restaurants, as well as work-from-home workshops. Daleen Mathee, the South African author, wrote her first famous novel, Circles in the Forest, about the early woodcutters who settled in Rheenendal. Some of the early mud houses dating back to as early as 1827 still stand today. Also of note is the gold rush that happened around that era, where gold was found deep in the Goudveld forest. Prospectors arrived from all over the country to stake their claim and a large gold mining village sprung up overnight. The gold however, was soon depleted and today only Mother Holly's tea room remains. So, calling all nature lovers, consider the beautiful properties in Rheenendal and experience the best of both worlds - living in the countryside, with the world famous town of Knysna right around the corner.